5'x5' can't be shipped as-is, but they can be specially cut for you so it can be packaged and shipped. Or you can pick up whole 5'x5' sheets at our store. A small labor charge for cutting the sheets is included in this price. Want different sizes than what' offered online? Contact us for a custom quote to cut what you need. If you can haul 5'x5' sheets, your price-per-sheet is less. The in-store price doesn't include a cutting fee. However, we would be happy to custom cut your sheets if you do need your sheets cut. A milling fee would apply. Supply is limited, so order today. These real wood veneer sheets are composed of premium sliced hardwoods that are spliced along the edges to make the full width; splicing is also done in a book matched pattern that's attractive and helps hide the splicing seam. The sheets use full-length slices so there are no splices to make the length. The 10 mil (10 thousandths) thickness paper backing allows the sheet to bend, flex, and work with curves and shapes without splitting. Apply paper back veneers with contact adhesive to make panels of large projects: conference tables, desks, doors, cabinet doors, coffee tables, etc. You have a lot of ways to buy from us! Wenge Turning Squares: 1-3/4" x 1-3/4" x 12"
Have you seen our awesome weekly newsletter? Genuine Mahogany Furniture Squares: 1-3/4" x 1-3/4" x 30"
An a amazing unique wood that's nearly 100% black. Wenge is also marked with slightly lighter brown streaks which gives the wood an unusual, yet delightful, appearance. Wenge is hard and heavy, and makes a superb accent wood in highly decorative projects. Dark brown to black with fine black veining. Furniture, cabinets, flooring, industrial, exterior. We want you to be happy with your order and our service! So if you still have concerns about what you need and what we can do for you, please call to discuss. Due to the limitations of website software, it's best to handle this type of order person-to-person. Hardwood lumber is different from standardized softwood lumber (such as 1x6 and 2x4 pine). Hardwoods come in various widths and lengths, which is why it may take longer to get your order together, and why you may need to buy more footage than you realize. The stack of mahogany above shows how lumber comes in many widths, rarely uniform. therefore the adjust the footage you order and bill it accordingly. Due the nature of hardwood lumber, each board in a stack is a different size, with different grain characteristics, etc. Our primary concern is providing you with quality material that you like. We want you to be happy and therefore we want to make sure you get what you need so your project can be a successful one. 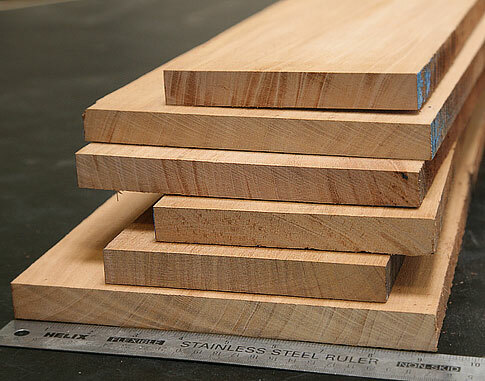 Hardwood lumber is usually sold as a bulk raw product in random widths and lengths. That means that our stacks of lumber have a big variety of sizes most often from 4" up to 12" wide, and 6' to 16' long. We do understand that your project might have some requirements, and we're happy to help you out. Custom Hand Selection: This is a selection for a minimum size, not an exact size. 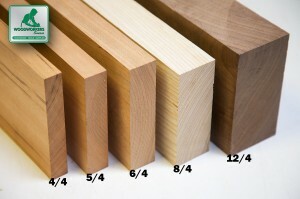 For example, if you want a minimum width of 6", we will hand-select lumber that will be bigger than 6". See the "Minimum Size Request" box on the order form. Custom Cutting: We can do some custom milling such as planing to a different thickness and ripping to width. This is quoted priced per job, so please call or email to for a quote. All of our lumber is stocked surfaced on two sides - which means the face and back of the boards are good and smooth and the edges are rough sawn. 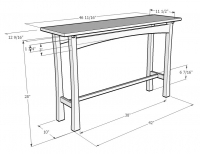 A rough edge is rarely suitable to be guided against a table saw fence. A straight line rip puts a true edge on the board so you can run it against a table saw fence and cut the width you need. A straight line rip is also performed after measuring the board. The rip will remove 1/16" to 1/8" from the width of the board. Hardwood lumber is primarily a raw product. It's been sawn from a log with big machinery that leaves rough surfaces. We then have the material surfaced (planed) on the two faces (after it's been kiln dried) and we stock it this way - smooth faces, rough edges. There are many benefits to stocking lumber like this, the biggest reason is because we find it to be a decent balance between cost and usefulness to the woodworker. Every aspect of machining adds cost to the wood, so we minimize that as much as possible by only having the lumber planed. It allows you to have a workable and smooth surface and also see the grain and color of the boards. Though every board will have to be jointed or straight-line-ripped eventurally, there's no distinctive advantage to stocking it with the edges already straightened. Plus it would add cost. Where many experienced woodworkers might prefer fully rough lumber, we find that many new and intermediate woodworkers do not have a planer, the critical tool for surfacing lumber. And we're here to serve woodworkers of all skill and experience levels as best we can. We will pull wood to meet or exceed the dimensions you need. If you need wood to be an exact size, no more and no less, please call for a quote for custom cutting. We will select material that can yield your specified dimension(s). That means we will to ship you board(s) that are wider or longer than you request, and therefore they may compute to more footage than you calculated. You will be billed for the actual footage that we ship. We always contact you first to discuss and make sure you get what you need and are not surprised by additional charges. 4. Do You Want To Order Exact Sizes?